When you hear it said of a man, that "he possesses a great amount of nervous energy," you can be assured that he has the power of expanding every ounce of strength that is in him, and then some. We all know that muscles, at the least the voluntary ones, do not contact of their own volition. All muscular contractions follow nerve-impulses which originate from the motor-centers of the brain. The legs of a dead frog will move, if you apply a galvanic current to the leg muscles. The twitching is caused by the stimulation or irritation of the electric current. Our muscles have always the power to contract; but are motionless until the nerve message, or stimulus, is telegraphed from the brain. There are individuals who possess nervous force, or what might be called " muscular will-power," in a very marked degree; and these individuals may be either of a stolid and phlegmatic, or of a highly nervous temperament. Usually the latter is the case. There are slender men and women, who possess greater strength and endurance than their size and development would lead you to believe. Various physiologists have give as an illustration the case of several different men competing at "chinning the bar." A well-muscled man without much nervous energy will chin several times in succession and at the fifteenth repetition he will have exhausted his strength, and his muscles are so tired that he cannot again raise his body. Another, and much frailer, man will show the same signs of muscular exhaustion at the end of the eighth repetition. By an effort of the will he will force himself up the ninth and tenth times, and then when you feel sure that he must be "through," he will manage to slowly and shakily drag himself up a couple of times more. I also have seen that happen, and I noticed a couple of things that other writers have failed to mention. In the first place I saw the first man, the one with the purely muscular strength, was in good condition at the end of the test; and that after a few minutes' rest he could have made a second trial and done almost as well as the first trial. And I also observed that when the slender, "nervous-energy" man finished his test, his whole body was shaking, and his arm muscles quivering so violently that he could hardly hold on to anything. Which made me doubt whether it was wise to thus force the muscles beyond the normal limit of their strength. This nervous energy is a fine thing to have in reserve so that it can be used in great emergencies; but I am convinced that if a man thus forced his strength, and spent his energy thus prodigally in his daily exercise, or his daily work, he would soon become both muscularly and nervously exhausted. A thoroughbred horse has nervous energy in a high degree and he will, when forced, keep on running long after an ordinary horse would be exhausted. But the result of such forcing is that the horse becomes "utterly spent." Remember the word "spent," and be careful when exercising never to spend your energy beyond your power to replace it. Sometimes you will find a man who has great muscular strength and to that adds unusual nervous energy. When you get a combination like that in one man, he is almost sure to be a star. Of such ability was a young friend of mine. A lad of extraordinary development and great lifting power, he extraordinarily good at making what lifters call the "two-arm-press' - that is, where you grasp a heavy weight in both hands, and push it slowly to arm's length above the head. He was so good that at any time he could beat all ordinary competition, but he never extended himself unless it was absolutely necessary. Once in a while he would cut loose. It might be against a particularly strong competitor, or just with the desire to see whether he could improve his record. On such occasions he would go the limit at his favorite stunt. After pushing up the bar-bell oftener than you would think it possible, he would on his hidden reserve of strength, and force many more repetitions by sheer nervous energy. And it never seemed to hurt him. To be sure he was anything but high-strung; being short in stature, and very chunky in appearance. A great expenditure of nervous energy is often accompanied with a marked loss in body weight. Thus a man in hard muscular condition will take part in an important football game, and because he plays with such intense fierceness, and literally gives his team "all he has,' he will finish the game five, ten, or in extreme cases, twelve pounds lighter than when he started to play two hours previously. And almost invariably he has to be given a week's rest to recuperate his energy. I have seen young fellows dressing for the game, and their muscles were clean-cut, and there was no visible fat. And at the end of the game, when they would stagger back to the dressing room, they would be positively haggard in the face, and their bodies would be gaunt; the muscles having lost their roundness, and having a corded appearance. If they had been measured I doubt whether the tape would have shown their muscles to be any smaller. What they had lost was the very slight amount of fat which is present in the body of every healthy and vigorous person. The kind of man who is small and slight and yet has enormous strength is met most frequently in the pages of novels. In actual life you rarely meet him. Often when reading, I have met a character of whom it was said, "in his slender frame he concealed the strength of a giant," but although I know hundreds of amateur and professional athletes I have never met but two men who answered that description. The first of them is a well-known physical-culturist, short of stature and without anything about him to indicate that he is very strong. And yet he can apparently exert strength in unlimited quantities, rarely failing to accomplish any stunt he undertakes. He can lift as much weight as can men who are twice as big, and is a wonder when in comes to finger-pulling or "chinning the bar" with one finger at a time. Although his muscles are not very big they are long and extremely clean-cut, for like most people who have great nervous energy, he never accumulates any fat no matter how much he eats and drinks. The other man is six feet tall, not noticeably broad, and weighs but 160 pounds. In street-clothes he looks more like a student, but when he strips you then understand where his strength comes from; for his body is covered with muscles like interlaced wire ropes. You can trace the outline of practically every muscle throughout its whole length. His flesh is extremely hard, and the muscles look lean and stringy. His claim is that his muscles are of extra length, and that while they may lack girth, they contain as many cubic inches of fiber as do the shorter and thicker muscles of a shorter and heavier man. 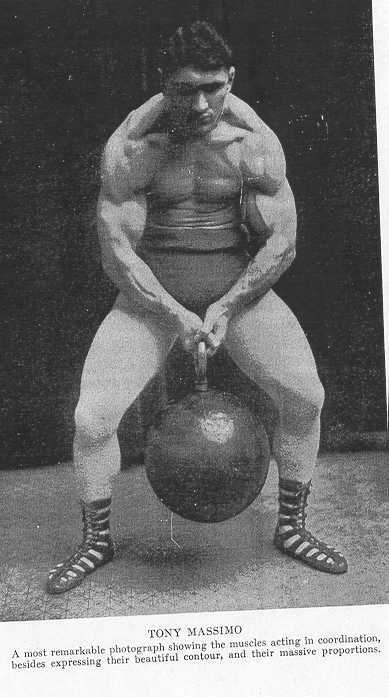 He is admittedly a very strong man indeed; not one of very top-flight; not in the class with men like Hackenschmidt and Nordquest, Saxon or John Y. Smith - very much stronger than 999 men out of 1000 of his own weight. But just the same he sort of worries me. Every time I see him work I get the impression that he is forcing himself too hard; that his strength is more nervous than muscular. Of all the very "Strong Men" I know he is the only one who seems likely to have a breakdown in middle life. My impression is that he trains too hard, and too constantly. He is like a man who is not only spending his own income, but borrowing in addition. Some day he will make a draft on his strength and be without the physical resources to meet it. To my mind those two men are just the exceptions that prove the rule that "real strength" comes from fine proportions, solid organs, and a great muscular development. Since 99 out of every 100 "Strong Men" are well-made and magnificently developed, we can assume that the way to become strong is to exercise in a way that creates ideal shape, and great muscles. That the condition of the nerves has much to do with strength cannot be doubted. The average "Strong Man," be he lifter, wrestler, lumber man or sailor, is usually of an even disposition, not easily rattled or excited, and very calm and self-controlled. And yet every thing a "Strong Man" can do, can be matched by the nervously deranged. One of the most startling instances of this was the case of a young woman who went insane in early maturity. She was a small, slender creature of the fragile type with no more strength than is possessed by other women of her size. After her mind went wrong, and they had to confine her, she had attacks of maniacal frenzy. And in those attacks she would perform incredible feats of strength, bending the iron bars in the windows, tossing around husky attendants as though they were infants; and on one occasion ripping a heavy iron grating out of the wall. This case is I believe famous, and there are other cases almost as remarkable. What I cannot understand is how the muscles and organs of an insane person can possibly stand the strain put on them. Consider the young woman just mentioned. If when in her right mind, she had attempted to bend a stout iron bar by means of a sudden wrench, her body would not have stood the strain. In the first place her fingers would have straightened out; because when normal she had not enough grip to hang by one hand from a ring. In the second place, she would have in all probability have pulled a tendon, or even torn the fibres of a muscle. Thirdly, the exertion would have been sufficient to have caused a rupture of the body-wall; and lastly, she would have undoubtedly broken a blood-vessel. But when in a frenzy, her muscles and tendons were apparently endowed with the strength of steel, and her heart and blood-vessels in some way become immune to injury. Naturally none of us value our strength more than our sanity; but instances like this are almost enough to shake the faith of the most confirmed muscle-culturist. But there they are, and you cannot ignore them. Before passing on, let me refer to thee "human magnets" who give public demonstrations of their strength, or more often of their resistance to the strength of others. They deceive many, but I can assure you that all they do is based on known principles of scientific leverage; together with the assistance of confederates. They are no more capable of doing real strength stunts than a sleight-of-hand performer is of actually controlling occult forces. To get back to examples of nervous force. It is not hard to add instances. There are sane men who under great stimulus, can exert twice their normal strength. I know a couple of amateur wrestlers who in friendly competition can show but little strength and who soon tire. But if something happens to get them "fighting mad," they are immediately transformed. They tear into their opponents like tigers, and amaze you with their sudden access of strength and endurance. You sometimes hear of a man, who in a desperate fight suddenly "goes berserk," and for a few minutes becomes a raving terror. The expression dates back a thousand years to when the old Vikings before a battle would, by means of liquor and mental excitement, work themselves into a sort of frenzy. Since after such a display, or attack, the fighting man has almost no recollection of the wonderful things he has done, it is fair to assume that he has not "been himself"; that in fact he has been temporarily frenzied; gone mildly inane, you might almost say. Contrasted to that you have the case where the individual lacks control of his nerves to such an extent that when under the paralyzing influence of fear or embarrassment, he loses his strength to such an extent that he seems almost helpless. Once there was a young amateur baseball player, who played third-base and was famous for the strength of his throwing-arm. He could "burn them across" with such speed that the first-baseman sometimes had to beg him to ease up. Well, this chap attracted the attention of a big-league scout, and was signed. He got his first chance on the day of an important game, where there were thousands of spectators. The regular third-baseman got hurt, and this chap was rushed out. On the next ball pitched the batter hit an easy grounder down the third-base-line. Our man gathered it in very clumsily, drew back his arm, and though he apparently put a lot of force in his throw, the ball floated as far as the pitcher's box and fell to the ground. Of course he was yanked out; for even the spectators could see that he was having an uncontrollable attack of stage fright. He could give no explanation of his own loss of power, except that his arms and legs felt as though they were made of lead; and that the slightest movement required a great exertion. And yet he was a powerful, well-set-up young fellow. There was another chap who impressed me by his physical strength. He always practiced by himself, being a shy sort of fellow; but after I got to know him well enough, I visited his little gym. To tell the truth I was a little disappointed because he failed to lift nearly as much as he had claimed he could. But I could see that he had great possibilities; and I went back a second time, and third time, and on the last occasion he did some strength-feats as remarkable as I have ever seen an amateur perform. Soon after that, I witnessed the performance of a team of lifters; and I felt sure that this young amateur could beat them at their own pet stunts. So I invited them to pay me a visit, and I arranged that my young friend should drop in casually. I chuckled to myself, as I thought how he would surprise those noted professionals. I was the one who got the surprise. For my young friend failed to make even a respectable showing, and in some lifts could not lift half as much as he would ordinarily. Of course my other visitors soon got wise to the little game I had tried to put up, and they kidded the poor fellow so that he went entirely to pieces. Afterwards I said to him, "You're a fine guy to let me down like that." He colored up and replied, "Mr. Liederman, I couldn't help it. I was scared stiff, and it seemed to me as though I had left all my strength at home." That was another case of pure nerves, for the lad really was exceedingly strong, and had as fine a set of muscles as one would want to see. And I know that his heart and lungs were OK. Again those are exceptions to the rule. Exceptions so startling that they are worthy of remark. A man who is famous for the strength of his body invariably will have great control over his muscles, and almost invariably an equal control of himself. If they have nerve attacks, they are the kind which increase the muscular power instead of diminishing it. Perhaps their public appearances have made self-control a matter of second-nature to them. This applies equally to a circus-performer, a champion wrestler or a great college football player. All of them have learned that in order to do their best they have to ignore the crowd and concentrate their mental and muscular power on the matter in hand. So they learn to control themselves; and, as I have already said, the "Strong Men" of my acquaintance are just as remarkable for their self-control--their mental poise--as for their bodily strength. Perhaps it is the knowledge that they are strong, the consciousness of their power, that gives them their control and courage. There is something about great strength that adds to one's vitality and nerve. For I have often seen a timid feeble man improve his nerve, and gain in courage and self-assurance as his muscles grow bigger and his strength increased.